What was difficult is now easy. The seca 869 is exactly right for those looking for a scale with practical cabled remote display and a handle for flexible use. This scale has many functions that make life easier. It‘s simple to use and easy to clean. The angle of the display can be adjusted and it can be used seperately from the base for easy reading and comfortable handling. Read the display while at your desk. The seca 869 makes your work easy. 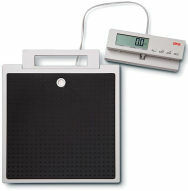 Simply place the display on your desk and the scale in front of it. Connect the two with the 2.25 meter/7.3 feet cable and you‘re ready to work. It‘s also easy to read the results since the tilt angle of the display is infinitely adjustable. Stability even on problematic surfaces. An especially large leveling base gives the seca 869 great stability. The display and operating element is similarly equipped with a stable rubber base and with an easy-to-use self-explanatory keyboard. Storage is also effortless, thanks to its compact dimensions and light weight. Measuring with all essential functions. The seca 869 has several convenient functions required in routine medical practice: BMI to determine nutritional status, HOLD to keep the measurement results in the display, TARA to tare the weight, e.g., to weigh a small child held in a parent‘s arms.